As this issue goes to press, the international Square Kilometre Array (SKA) Site Advisory Committee is considering South Africa and Australia's respective bids to host the world's largest radio telescope, with an effective receiving area of one million square metres. First mooted in 1991,1 the project is drawing increasingly close to realisation. Following the 1996 White Paper on Science and Technology2 which identified astronomy as an area of key geographical advantage (further reinforced in the 2002 National Research and Development Strategy), South Africa has been energetically pursuing major astronomy projects. The first such project was optical astronomy (SALT). Since the mid-2000s, the thrust has been in radio astronomy, initially with the KAT (Karoo Array Telescope) and now MeerKAT 3,4, 5 ('more of KAT' in Afrikaans; also the name of the suricate, a member of the mongoose family found throughout the arid areas of southern Africa). The seven-dish KAT-7 array is in the science commissioning phase at present. Detailed technical plans for the 64-dish MeerKAT are almost finalised following successful completion of the concept design review in 2010 and preliminary design review in 2011. The budget has grown significantly - in 2006, R300 million was budgeted for the rest of the decade, a figure which has since increased several-fold as the project's scope has widened. (It should also be noted that building MeerKAT is independent of the success - or otherwise - of South Africa's bid to host the SKA). MeerKAT (and South Africa's bid for the SKA) inevitably brings into question the continual conflict between 'big' and 'small' science. Although funding for especially applied research has increased significantly over the last few years, the South African science community is not lavishly funded by international standards, and the project (and indeed the favoured status of astronomy) has its critics.5 Aside from the scientific aims of the project, it is important to understand that this forms part of the Department of Science and Technology's focus on mission-driven innovation, which was largely absent from South Africa during the 1990s. This followed the end of the key technology missions of the previous government, in particular military dominance of the subcontinent and energy self-sufficiency. The potential for technological spin-offs from South Africa's SKA project as a prime example of this form of innovation is the main thrust of this commentary. It is instructive to consider previous technological spin-offs from earlier large technology-based missions around the world, noting that, at the time many of these were undertaken, these spinoffs were serendipitous, rather than planned. As a first example, integrated circuits lie at the heart of almost all modern electronic devices, from the ubiquitous cell phone and personal computer to most household entertainment devices and even 'white goods', such as refrigerators and washing machines. Integrated circuit technology was strongly driven by the US space and missile programmes of the 1960s; solder welds on discrete circuits (i.e. separate electronic components such as transistors and resistors) were a major source of failure in the harsh launch environment and fabricating all the components on a semiconductor substrate was a major advance, rapidly exploited commercially. More recently, the invention of the World Wide Web at CERN is an extraordinary example of how initially highly specialised technical requirements - in this case, making results of particle accelerator laboratories readily accessible to international team members - can ultimately revolutionise commerce in an entirely unplanned fashion. Presently, NASA's Jet Propulsion Laboratory is spinning off advances in robotics pioneered for the exploration of other planets for medical projects such as robot-assisted microsurgery. Finally, it is interesting that Intel, the world's largest (by revenue) semiconductor chip maker, regards the SKA project as of particular importance in driving developments in very large scale computing. In terms of MeerKAT, which is primarily an interferometric array, there are a number of technological challenges. (An interferometer is a device in which electromagnetic waves are superimposed in order to extract information about the waves. The earliest radio interferometers appeared just after World War II, in which interferometry was used to increase angular resolution of single targets. Subsequently, synthesis imaging was developed, whereby an array of antennas was used to form high-resolution images of extended regions of the sky.) These challenges include: the design of the custom-made dishes and feeds themselves (which requires careful consideration of the interplay between electrical and mechanical design characteristics, as well as optimisation in a large design space); the design of reliable and power-efficient cryo-coolers for the cold 'front end' (the front end comprises the receiving element or feed, often a horn, and the low noise amplifier, which sit at the focus of the dish); the digital back end, in particular the correlators, which multiply and integrate the digitised signals from each baseline (pair of antennas) and which have to operate at very high data rates; the data reduction computers, which form images from the correlated data using sophisticated image processing algorithms; and mitigation of radio frequency interference, to ensure that the very weak cosmic radio signals are not drowned out by either interference caused off-site (e.g. by farming activities) or by noisy electrical or electronic elements in the system itself. There are other major engineering challenges relating to the infrastructure: the provision of power to the remote locations of both the South African site and - even more so - the Australian site is a nontrivial problem, where 'green', non-noisy solutions could assist; and a significant part of MeerKAT's budget has been spent on upgrading roads, extending power lines and laying fibre-optic cables to the middle of the Karoo. The MeerKAT project has had to address all these topics. In terms of the dishes and feeds, KAT-7 focused on a tried and tested antenna topology - a prime-focus parabolic dish - but the antenna used novel construction techniques. The basic dish is of composite resin construction, and is moulded on-site in the Karoo. 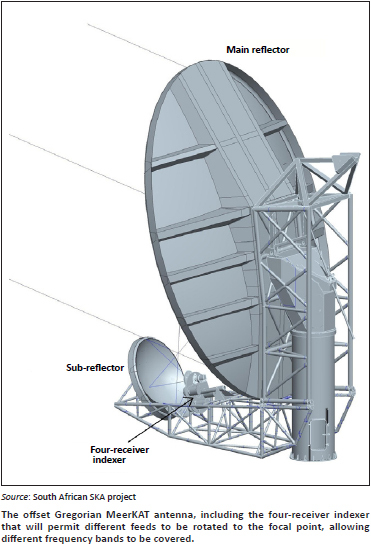 A metal mesh is embedded within the resin to make the dish electromagnetically reflective. MeerKAT uses a more ambitious offset Gregorian configuration, with a large main reflector, smaller sub-reflector and feed. Stellenboschbased company EMSS Antennas are the main contractors on the electromagnetic design of the antenna, and the company has grown significantly as work on the project has expanded, also developing expertise in cryogenics. This company has already demonstrated an ability to commercialise innovation via a project (not directly related to MeerKAT) to develop and market an electromagnetic field sensor; this sensor is readily being adopted by cellular providers to assist personnel servicing base stations to comply with safety standards. It should also be noted that computer simulation plays a major role in the design of modern antennas, and issues identified during simulation of KAT and MeerKAT have already fed back into research and development on future features for FEKO, a leading international computational electromagnetics code produced by sister company EMSSSA. (FEKO was widely used in the design of the antennas.) Much of the work on both antennas and computational electromagnetics is undertaken in close collaboration with Stellenbosch University. The mechanical expertise on the KAT-7 dishes has been sourced from two companies - BAE Systems Dynamics (SA) and MMS Technology, with the former being the prime contractor for all antenna construction and the latter undertaking all design and fabrication of the composite reflector structures. Techniques developed here may find application in areas where large dishes are needed in geographically remote areas. Data processing is a major issue with such large interferometric arrays. In the planned 64-dish MeerKAT, the initial precorrelator data rate of several Tbps (101 2 bits per second) will be reduced to just over 100 Gbps (109 bits per second) in the online system, before calibration and imaging reduces this to rates of sub-Gbps. These data rates can be handled with present technology. However, current indications are that SKA will require initial computation rates in the ExaFLOPs range (101 8 floating point operations per second). The very high data rates are a result of the much larger number of baselines, which scale with the square of the number of antennas. The fastest existing computers worldwide are presently capable of peak operational performance in the order of several PetaFLOPs (101 5 floating point operations per second). It is not presently clear whether an ExaFLOP system is technically feasible; nonetheless, research is already in progress towards this goal. (In particular, there are major and presently unsolved issues with thermal dissipation for such putative systems.) The current era in large-scale computing has been dubbed 'the era of big data' and solutions sought for SKA will have spin-offs in other fields where very large data sets must be processed, transmitted and then mined for new science. The KAT office in Pinelands (the main engineering office of the SA-SKA project) has a particularly strong focus on digital signal processing (DSP) for the digital back-end (DBE). The workhorse is the ROACH (Reconfigurable Open Architecture Computing Hardware) board, developed locally in collaboration with international organisations and also with the close involvement of the University of Cape Town. This board uses state-of-the-art computing for the high-speed real-time computations required in the DBE systems. The board is based on a field programmable gate array (FPGA). An FPGA provides high-speed parallel computation with moderate power usage. Embedded real-time DSP has many applications, for instance in radar systems such as ground penetrating radars used for the detection of buried pipes during construction work, and collision avoidance radars under investigation for motor vehicles. ROACH-board technology may well be one of the first candidates for a new spin-off development. As outlined above, processing of 'big data' requires very high speed computing, and, recently, grants for two research projects on high-performance computing in support of MeerKAT were awarded to groups at Stellenbosch University and University of Cape Town (the author is principal investigator on one of these). The planning for MeerKAT has been characterised by paying particularly careful attention to the radio quietness of the site. Whilst the MeerKAT site has been lauded for its radio quietness (Vodacom has even engineered special antennas to place a deep null in the direction of the site for its base stations in the site's proximity), electromagnetic noise generated by the on-site electronics (power and switching systems, digitisers, cryocoolers, correlators, etc.) poses a significant challenge, as does protection of the equipment from lightning. This general field is known as electromagnetic compatibility (EMC) and MESA Solutions, based in Stellenbosch, has been actively involved with the KAT office and subcontractors in developing both an understanding of the EMC issues and providing solutions based on an extensive on-site measurement campaign backed by careful laboratory and computer simulation work. EMC is a major issue in the design on contemporary electronics - products sold into the EU, for instance, have to pass stringent acceptance tests - and the massive open-air laboratory of the MeerKAT site has led to very advanced work in this field which can be expected to spill over almost immediately into industry. It is important to note that right from the start, SA-SKA was not just conceived as an engineering project, but had a very strong human capital development programme; clearly lessons were learned from criticism of the SALT project which was perceived as focused almost entirely on building a telescope. To date, close on 400 students have been supported at tertiary level (including 22 postdoctoral fellows). At the top level of this pyramid, five earmarked SA-SKA research chairs are in place. Also noteworthy are new initiatives in radio astronomy which are not directly linked to the SKA site bid, but have resulted from the high level of activity in this field at present. In particular, there is a proposal to develop an African Very Long Baseline Interferometry (VLBI) Network. This network intends recycling recently decommissioned telecommunications dishes (many of which are quite large, 32-m diameters being common) across Africa. A pilot study is underway in Ghana at present. The potential for adding significant technical value locally is exceptionally attractive in the context of the African continent. Of the students supported in the Human Capital Development programme, 48 (of a total of about 400) were from other African countries, so the required technical skills are already under development. In conclusion, the South African SKA programme has the potential to be a compelling example of mission-driven technological innovation. This potential is in addition to the obvious excitement of building what will be one of the world's most sensitive radio telescopes in the shape of MeerKAT, with an excellent view of the southern skies, and the resulting new science one can expect. The SKA programme has already educated a new generation of highly skilled scientists and engineers in the science of radio astronomy and associated fields of engineering, and will continue to do so. As outlined in this commentary, there is every reason to expect significant technological spin-offs in the near, medium and long term and the project enjoys the strongest support at ministerial level. Special mention should be made of the plenary address by Minister Naledi Pandor at the July 2011 SKA Forum in Banff, where she not only very strongly supported the South African bid for SKA, but gave one of the most eloquent addresses at the conference in support of the entire SKA project. Whether South Africa eventually hosts all, some, or none of the SKA, the technical footprint of this project promises to be deep and long lasting. This commentary has been influenced by many discussions with engineers and scientists in this field which have taken place over a number of years. I would specifically like to acknowledge Prof. H.C. Reader (SU), Francois Kapp (KAT office) and Dr Isak Theron (EMSS Antennas) for their reviews of the draft and Willem Esterhuyse (KAT office) for the technical drawing of the MeerKAT antenna.